Who is picky when it comes to mascaras? I can honestly admit I am! The perfect brush, appropriate wetness/dryness, blackest black, no smudging, easy to apply, no flaking during the day and curl hold – of course. Those are some of the criteria what I look for in a mascara. When I was kindly offered an eco mascara to try, I honestly decided I would judge this just like any other makeup product. It should be as good as any of my “regular” ones - otherwise I simply wouldn’t reach for it. Today I’m taking a look by eco brand Inika’s Long Lash Mascara*, let’s see how it performed! 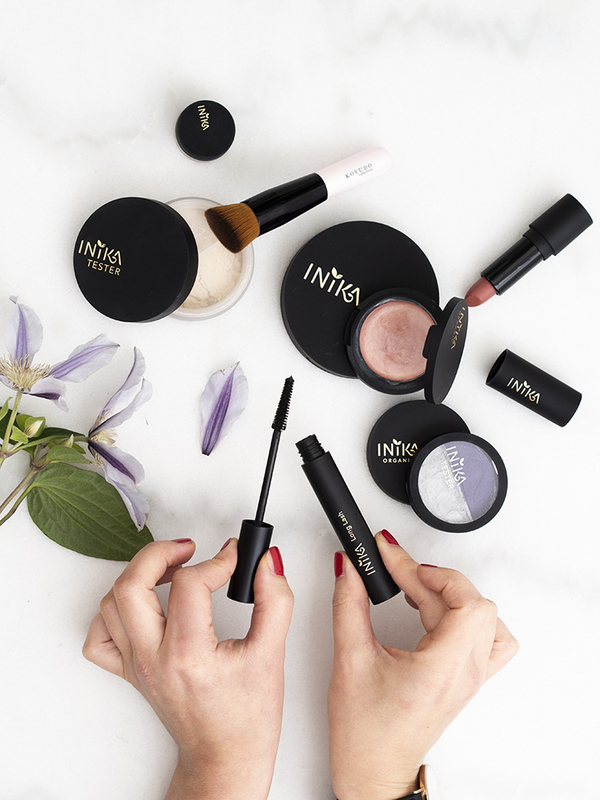 Inika is an Australian owned, very clean makeup brand with both mineral loose powder and pressed/liquid makeup. The brand is 100% certified cruelty free, registered with the UK Vegan Society ie. has no animal-derived ingredients. Read more about their certifications here. The Long Lash Vegan Mascara promises to use 100% plant-derived and natural ingredients to boost length, volume and lash length. Also available in brown. £23 / €29.9. Available for example on Inikaorganic.com and House of Organic (Finland). There are two things I noticed when first starting to use this mascara: the wand is very slim – the kind of wand I personally prefer and the formula feels very wet. I either like a slim curved wand (like Heroine Make Volume and Curl) or a long brush (MAC Extended Play Gigablack). Inika’s wand has a slight cone shape with a slightly slimmer tip. This makes mascara application near inner and outer corner very easy, for my eye shape at least. The wetness might divide opinions about this mascara. I often like a mascara when it’s slightly dried up, as it makes building volume much easier. Also, there’s less chance of the mascara smudging if I happen to blink accidentally. I keep a biodegradable Q-tip at hand when I apply the mascara to my lower lashes, but otherwise there is no problem (for the pictures I didn’t clean up at all). I liked Inika Long Lash Mascara at my first try, but after a couple of weeks I’m liking it a lot. I especially enjoy how black this makes my lashes with only one easy coat. I don’t find the mascara flaking or smudging during a long day, but as it’s non-waterproof and not a tubing formula you should check yourself if you happen to shed a tear. In this case the mascara might bleed. But being non-WP/tubing makes the mascara very easy to remove, you need no hot water or rubbing – nice especially for sensitive eyes. For my personal preference, I’d love more va-va-voom volume, but this mascara is still very nice for daily wear. Similarly to MAC or Heroine Make I mentioned above: curl, length and definition is what I need most days. Inika performs very nicely, giving lots of color and separation with one coat. I wouldn’t guess it’s not a conventional mascara. The price is a bit steep for what I like to pay for a mascara, but if there’s a sale I will certainly grab a new one. *This product was kindly offered for review. All opinions and observations are honest & my own.